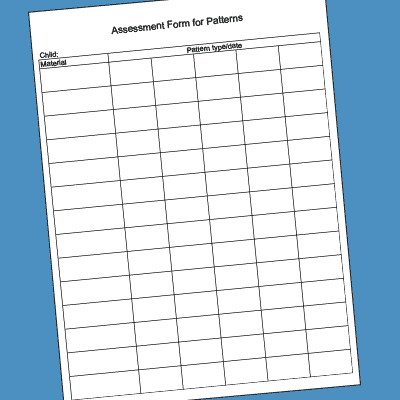 These assessment forms for Pre-K can be used to record children’s progress as you work with them during learning activities or observing them through play. 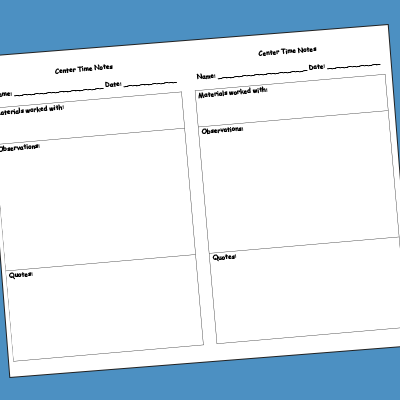 These printables are free for use in classrooms; however they are not to be re-published or sold in any form. 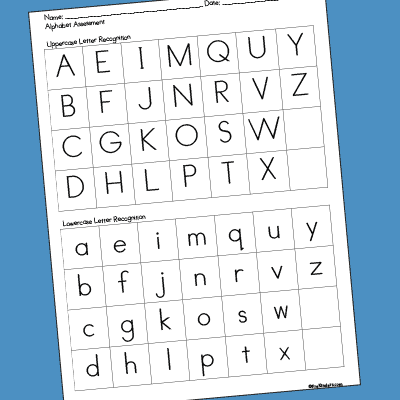 If you wish to share these printables with other teachers, you may do so by providing a link to this webpage. You may also share them in printed form as long as you are not selling or re-publishing them. If you have any questions, please contact me. You can either mark through the letters the children know with a highlighter or make a checkmark beside the letters with a pen. Use a different color highlighter or different color pen for each semester’s assessment. 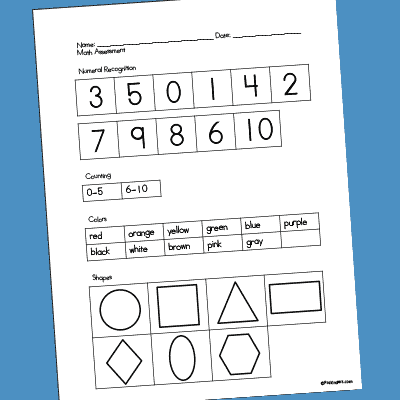 You can use this one sheet for a child for the whole year, and show a comparison of their progress with the different colors. Use the colored highlighters or pens mentioned above on this sheet also. For the color assessment, show children pieces of construction paper. I cut them into squares about 4 inches and staple them into a flip book. For the counting assessment, I have children count Unifix cubes. 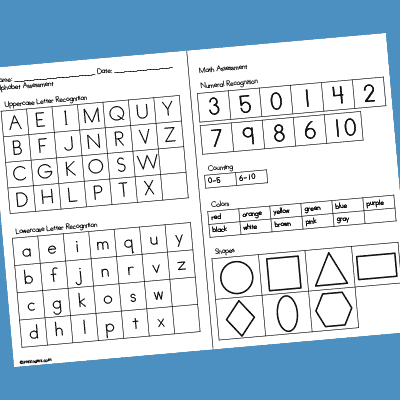 This is the same Alphabet Assessment and Math Assessment above, but this one has the two assessments combined on one sheet. 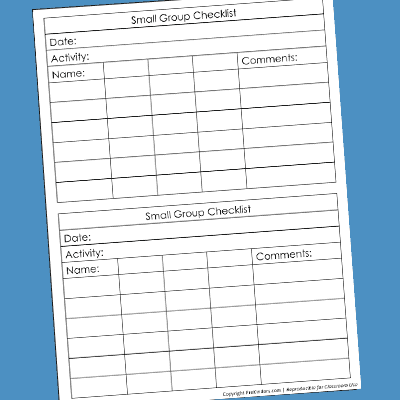 Use this Small Group Checklist to keep track of observations during small group lessons. 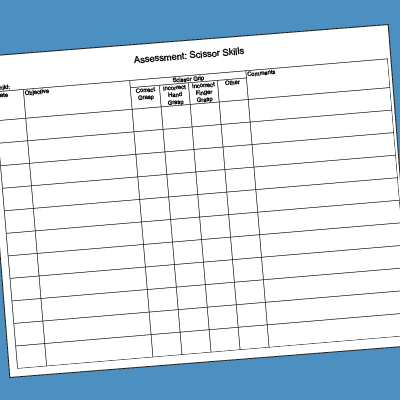 Use this sheet to check off children’s scissor skills and grip as you observe them cutting. Use this sheet to check off which pattern types children have mastered. 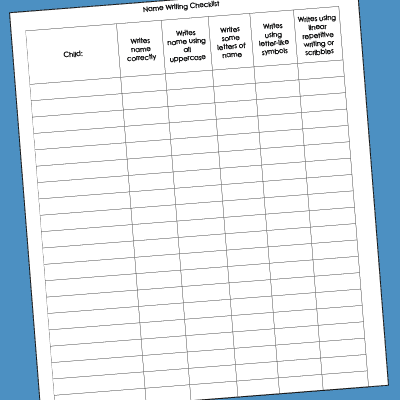 Use this form to keep track of where students are progressing in writing their name. This this form while observing children in Centers. I am a licensed teacher as well as a Director for a ChildCare center, so I am incorporating this forms in my tutoring segment for the child care and I am so blessed to have things that I can leverage to further promote our children’s cognitive and social growth!!!! Thank you so much for sharing AND for sharing for FREE. I love your website! It is so helpful. I am a teacher from N.Y.C. Thanks for making all your great printables free! You do great work! Just wanted to say what a great site u have. I am a manager of a KG Unit in Cairo, Egypt. I have found your assessment forms very useful. Thanks for sharing this Information will be used in my classroom and will be shared with other co-workers. Infinite Thanks Ms. Cox! Thank you for helping me to have a successful first year as a pre k autism teacher! You are helping so many teachers, so many children in so many places!!!! Thank you so much for sharing your very helpful forms, much appreciated!! You are a life saver. I have worked with children for a few years, but this is a new experience for me to work with pre-k as the lead teacher. I had a few ideas of how to get organized and how to build their portfolios. Now I have a lot better picture of what I need to do when school starts. Just wanted to say thank you for making this site. I am going to be teaching Pre-k students who are on the Autism Spectrum for the first time at our school in Maitland, Florida. It will be the first time our school has had this type of unit. Your site is helping me SO much! I really appreciate everything that it offers. Thank you!!! Thank you for sharing all of this much needed information and free assessment forms. As a first year Pre-K teacher I have found them to be very helpful. God Bless! Thank you. Your ideas were really helpful. I love your website! Im on placement and this has been a blessing for me to have found you and will be using this next year when I start teaching preschool! I live in Adelaide and the kids are going to love these activities on Monday!! VERY useful forms!!! THANKS for making them available!!! Thank you for this awesome site. I truly love the information that you put here for teachers and families to use. I found this site so helpful. I have done parent teacher conferences before and have used many different assessment tools but I found this site to help make it more simpler and easy. Thank you so much for posting these. Thank you for your help! I am using all of your assessment sheets in my binder! I am a full time pre k teacher. The resources are good resource for my teachers. Thank you Big time! Hi! I was looking at your progress report and noticed that you had “N/A” marked for “answering story questions” for the month of December. Don’t assume children couldn’t answer questions about stories at the ages of 4 and 5. I have students who are awesome at answering story comprehension questions! With this being the age of Common Core, students need to be challenged and pushed to think at a higher level. Just giving my 2 cents! I enjoy your website and visit it often! Hi Stacy, I’ve always done story comprehension all year long, including retelling stories and answering questions about stories. This is a progress report from my previous school, and we just simply did not assess that (and a few other things) during the month of December. I definitely know they are capable of doing it; it was simply left off to not overwhelm teachers during the first assessment time. You are welcome to adjust the progress report to your needs. It’s a repeat, but I love your website, thank you for sharing. Thanks a lot, this website is amazing! Very helpful! Thank you for making this website. I am just start home schooling my 5 years old son. We live in Thailand. These information is very helpful. Hi karen, your website is definitely very significant for me to use in the classroom with parents of high expectation when it comes to answering their questions about their child all i have to do is to show them the assesment tools. Thank you so much. God Bless You!!!! Fantastic site!! Well done & keep it up!! I’m sure you are helping lots of educators, parents, carers & grannies!! Thanks. Thank you so much for creating and posting the assessment forms. I have been searching the internet for some and your website was where I was led. It is fabulous! Thank you, so happy to know my child is on track with the math and abc. Just wanted to say thank you for sharing resources with us. I am a fluency teacher at SEK Guayaquil, Ecuador. I have found your website extremely useful. Thank you so much for the assessment forms. Anything to make life easier. Thank you very much for your selfless sharing of knowledge for the love of our children (our own and our students). I have bookmarked your site for frequent reference. Mabuhay ka, Karen! Bless you, Karen. I just used some of your “doables” for my Action Resesrch; I gave you credit for them. Fantastic ideas! I am a Pre K Teacher working in N.Y.C C.B.O classroom. This is a very good website that assist teacher. Your website is amazing and I am using your documents to help me be more organized in the classroom. I am located in Wayne county Ky and work in preschool and your website has given me a new and refreshing approach to my paperwork load, so to speak. This year is going to be great and thank your for your time spent on making your site available to others! Thank you for all of your helpful resources! 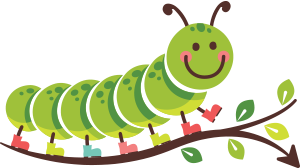 I am a Pre-K teacher in Ohio and I have been using your website for ideas and printables for a couple years. Keep up the awesome work! THANK YOU, THANK YOU, THANK YOU!!!! I have been over the childcare center and teaching Child Dev. classes at the high school level for the last 4 years and have just opened a preschool out of my home— this has saved me SO much time trying to reinvent the wheel. I can’t thank you enough for helping! And FREE…. amazing. Thank you for these fabulous forms! 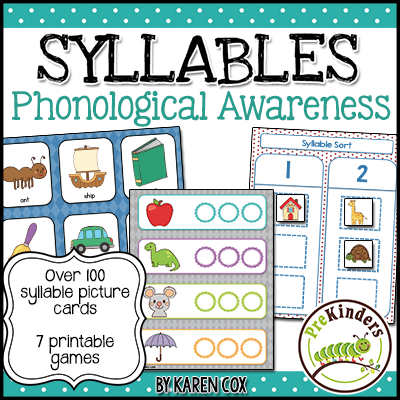 I am starting homeschool pk 3 with my quadruplets and these are great for checking their progress. I’ll take a baseline now and check back in December and again in May. Outstanding materials! The state of Georgia is sure lucky to have you, and I thank you so much for sharing. I really like your website. It is very useful. Thank you for sharing so much resources and inspirational activities ? I am a pre kinder teacher from Indonesia ? Thanks so much for the wonderful assessment tools! Thank you for sharing this stuff. Thank you for your kindness. I like the assessment form. It will help me a lot about observing the children and plan for the next activity that is suitable for each child. I am having a little difficulty opening the alphabet assessment. I have not had this issue in the past. Any suggestions? I just got to say I love this site and you are the best! I am starting my first year of Pre-K teaching at the Daycare/School I work at. I use to be the Playschool Teacher(toddlers) but am stepping into a new position and am nervous trying to get everything organized for next month. This site is a life saver. I am finding things I didnt think of or was never clearly given to me or explained in school. I love my toddlers but im excited but also a bit nervous for this new step and I really believe you just help ease some of the stress. Thanks, Liz! Congrats on your new position! I appreciate you posting and sharing. This will help me a lot with my prekindergarten class. I love the assessment forms. Thanks again. I absolutely love these assessments and that you are willing to share! I am a special needs teacher for students a bit older however working on the same types of skills. 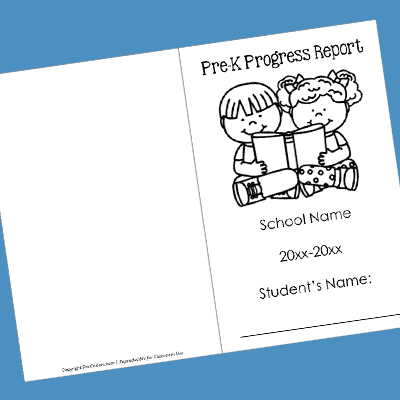 I was wondering if you are willing to share your PreK report card in Word/Excel format so that I can edit with my IEP goals? I love the way it is all laid out on one page. It would be very helpful to me at IEP meetings for sharing data with parents and regular education teachers. Hi Barbara! I would gladly share it if I had it. The original file was Excel, but a few years back, I had a hard drive crash and lost the file. I plan to remake the form at some point. It’s on my to-do list. Many thanks Karen for sharing your resource with us, I pray God bless your continuously as you open your heart to share. 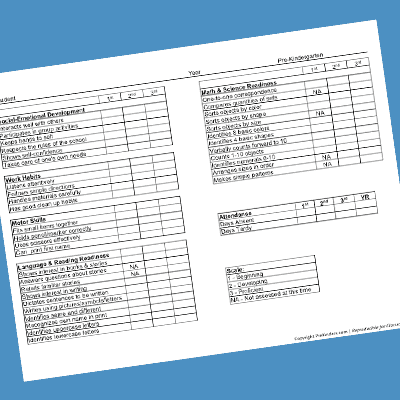 Do you happen to have an editable version of your assessment checklist page? I would like to use your form but add in a few skills, such as rhyming, syllables, tracking/counting words, positional words, and a few other items? Hi Stephanie, I don’t have that available at this time, but I’m planning to work on that form this summer. The original file as lost years ago when my hard drive crashed, so all I have is the PDF right now. For next school year, I’ll have an improved version. Thank you so much for these assessment tools, we have downloaded them and with some ‘localization adjustments,’ we will soon deploy them for assessing kids and supervising teachers. You are an Amazing Wonder. God bless your heart ! I absolutely LOVE Prekinders. Everything I need to start the New Year off for my new, fresh Kinders! It’s not as easy as the end of the year…… Thanks A lot !! Wow! I am so happy to come across your website, you really inspires me and you make every work easier. Big thumb up for you! I so much love Prekinders. God bless and increase you more on every side. I’m a Director at a Early Learning Center and I truly appreciate you for sharing this information. It will be extremely helpful in measuring academic and social progress. I’d just like to show you my appreciation and gratitude for creating this free website. It’s been a great help for all of us Prekinder teachers. (By the way, I’m a PK teacher in Union City School District in NJ). You’ve been an awesome blessing to all of us. Thanks a bunch and Happy Thanksgiving!